Buy Yakso Organic Seitan in Tamari - 330g in the UK from our online shop or directly from our independent Scottish store. If you want to automatically receive an email when 'Seitan in Tamari Sauce' is back in stock, just leave your email address below. High protein meat substitute. Use it in stir-fries, indonesian and asian dishes or with fried rice. Suitable for vegans and vegetarians. Seitan is made from wheat gluten and can be used as a meat substitute in everyday cooking. This seitan is not refrigerated (but needs refrigeration after opening), so it is safe for us to post it out. Seitan is suitable for vegans and vegetarians. The seitan itself doesn't contain soy, but the tamari sauce does. We sell real Yakso and other Meat Substitutes directly from our shop in Scotland and online throughout the UK. View more products from Yakso. Where can you buy real Seitan in Tamari Sauce safely online? 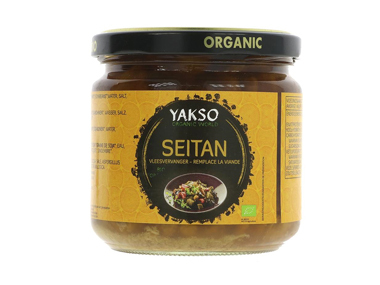 If you are wondering where you can buy Yakso Organic Seitan in Tamari - 330g safely online in the UK, then shop with us. Seitan in Tamari Sauce - Yakso Organic Seitan in Tamari - 330g in Meat Substitutes and Foods.